This stunning long katana by Kanesada has the most pronounced masame hada I have ever seen in a sword. The cutting edge is 27 3/4" long. This classic quality work has a very elegant shape with stunning sugu hamon and did I mention the Masame hada? In full new Japanese polish, shirasaya and solid silver habaki this sword comes with NBTHK hozan papers which attest to its quality. 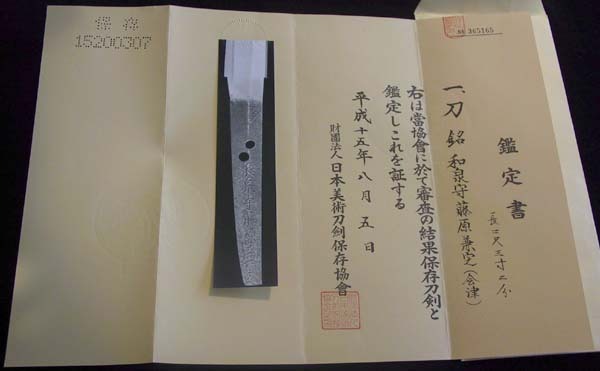 I am not sure which kanesada made this sword but I believe it to be late Shinto period. Definitely a great study piece that the eye will never become tired of.